Bates Family Blog: Bates Updates and Pictures | Gil and Kelly | 19 Kids | Bringing Up Bates | UP TV: You're Invited! Trace Bates, 19, and Carlin Bates, 17, are graduating from high school this year, and they want you to help them celebrate their accomplishments! "truly grateful for the roles that our friends and those watching Bringing Up Bates have had in our lives." Gil and Kelly Bates will announce the details of the party in the coming weeks. Congrats Carlin and Trace! What colleges are you looking into? What major? Are they thinking about studying to become a teacher like their older sister? Just because they are graduating high school doesn't mean they have to go to college. A lot of intelligent people get training in a vocation and start working. I want to meet Carlin so bad. She is my favorite. This is so Cool!!!!!! Hopefully I could go!!!!!!! Congrats to Trace &. Carlin!!! I would love to attend. My granddaughter and I love to watch together. When she comes over she will ask if I have any Bates she can watch. So glad I have a DVR. She loved Bradley's birthday party. It is such a blessing to find a show that I can watch and not worry about the content. Why is Trace graduating at 19. Usually you graduate at 17, maybe 18. Was he held back a year or something? Some people graduate at 19. If you look at their birthdays, Trace just turned 19 in Feb. and Carlin will be 18 in a week. Most people graduate at 18. I think they're just 13-14 months apart, so probably their mum had them in the same grade to make it easier. The older kids are all so close that I guess they would have had one child for each grade, otherwise. I would imagine that it's convenient to group them. Depends on when he was ready to start learning. I have one that was ready for Kindergarten at age 4, and another that wasn't ready until age 6. Just depends! Homeschoolers are on their own timelines. Maybe Trace graduated at 18.5 yrs old and Carlin wasn't too far behind in her studies so they decided to save money, and celebrate their graduations at the same time??? The Bates children are home schooled, so I doubt he was held back. Maybe he was just working at a slower pace. Probably not held back, he was probably just working at his own pace and in public school most kids graduate at the age of 18-19. That was really unnecessary to ask. No matter what the reason it's his alone. Congtatulations to Trace! I was thinking the samething. But I graduate at 18 since my birthday is in January, Trace would have graduate last year at 18 since his birthday is Feburary. Trace was home schooled so maybe Kelly Jo held him back. Maybe is was in Special Ed. You can't "hold" back with homeschooling! Each child progresses at his/her own speed - some students need longer than traditional 36 weeks - kudos to Kelly!!! Yes he probably was held back a bit. High school is harder for some than others. They might take more than one year to complete and subject. Congratulations Trace and Carlin!!! Awesome job! Most people in the US graduate at 18. One of the wonderful things about homeschooling is that a student can take a little more or a little less time depending on their individual needs and goals. I am a teacher and I noticed many kids would benefit from a little more maturity before entering school...dealing with everyone based solely on age can be very limiting and even harmful. Once someone has graduated, no one will ever ask or care about graduation age. So congratulations Carlin and Trace! Usually you graduate at 18 in less your birthday is June-Dec then you graduate at 17. Probably, if I had to guess. :) My brother will be 17 in May and he is a sophomore, rather than a junior. He was just held back a year, so he will graduate when he is 19, just like Trace. (Original question poster)~ I was home schooled so I completely understand the trials of being home schooled trough high school. I graduated two years early, so I must not understand how you could graduate late. Trace just turned 19 in Feb., and maybe he finished high school in Dec. at 18, and they are combining his Grad with Carlin's. She'll be 18 this month. Really?! Tired of seeing all these replies about Trace being held back. Homeschooled children can not be held back and some will finish early, my husband was homeschooled for his high school years and graduated at 17. I would think that it most likely it's just that since Trace and Carlin aren't too far apart in age that Kelly Jo simply had them studying the same things at the same time, so they are finishing their High School Diplomas at the same time. All I have to say to the two of them is Congradulations! And that's all people really should be saying, not debating about Trace graduating at 19. Congrats to you two an awesome job !! Wait. Are you saying the party is open to everyone? It is. :) Details coming soon. Wonderful!!! That is encouraging news .I hope that you both continue to pursue further educational options . Congratulations Trace and Carlin!! I would love to come to the party. 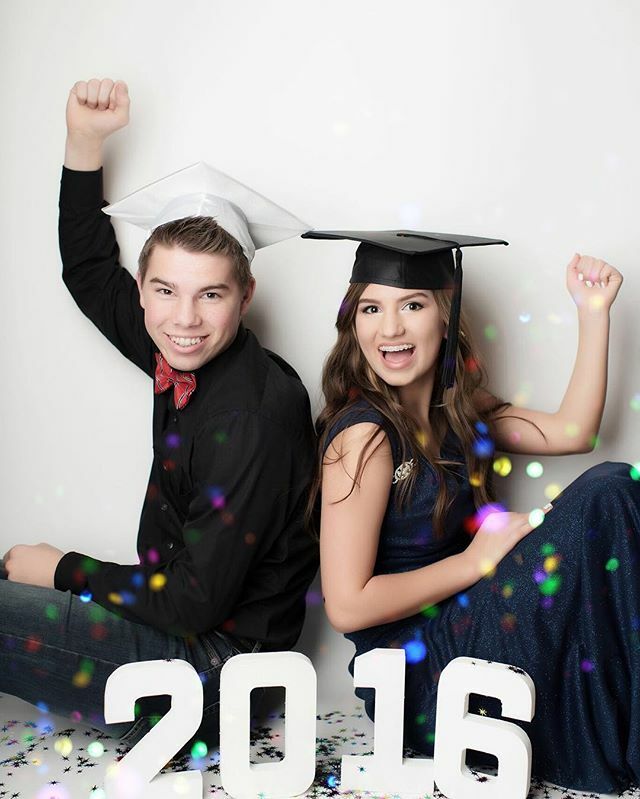 Why is Trace graduating high school at 19?....They are 2 years apart....why are they graduating at the same time? Wow! I can't believe they're already graduating! If I see an episode about Joy-Anna's graduation, I'd scream like a little girl. Thanks Lily and Ellie for keeping us posted. Is Carlin (or Trace) enrolling in Pensacola CC? I'm guessing Carlin is going to PCC and Trace to Crown? Thanks for answering. Aww!! Congrats Carlin and Trace! :) Lily and Ellie, does this really mean we are invited!? Yep! The Bates family is opening the party to the public. Really? Even though they don't know us? Thank you Bates!! Very generous of you! Congrats to the both of you.God bless you both. Congrats Trace & Carlin!! Thanks for invite your fans to your graduate party. About 3 hours away. Seriously considering going. Congrats to you both. I have a question.... I understand you guys are on the UP station. I do not have that station. Can I watch your shows online? If not I may call my cable provider and see about adding UP and switching up some other stations. Lol.. Hope they let me. I have read a lot of positive things about your family and would love to get to know you better bu becoming a weekly viewer. By the way, you have a beautiful family. You should switch to Direct Tv. Thats what I have. try http://thewatchseries.to/serie/bringing_up_bates , it's what I use since I don't have the UP channel either, only thing is that they don't have some of the episodes, like after Michealla's wedding, it just skips to Back Seat Bates. You do know it isn't the Bates family who writes this website, right? I understand there are a lot of kids but you should get your own party. Can't wait to hear the details. Maybe live streaming??? I was held back a year. I promise I'm not slow in anything. But...the ridiculous remarks on here leave me to wonder if you all should have taken a class in social skills and manners!! I want to be nice but some people writing these statement on age, when they should graduate should go back to school yourself. Kelly jo is doing her best, you try to bring up 19 kids, keeping up the house and teaching all of them. And have dinner on the table. You never see a maid do you?? Congratulate Kelly jo and Gill job Well done. Congratulations to your both! God bless you in your future endeavors.